For the last couple of days travelling up through France from the Pyrenees we’d occasionally experienced another kind of blow – the wind. It’s a powerful force. As we were heading up towards Chartres we ran into a stiff headwind that was slamming into the front of poor ol’ Guillaume and felt like it might halt our progress. Aided by the bow wave from a passing lorry/truck in the opposite carriageway, it did rearrange my towing mirror. I had to pull in and realign it. 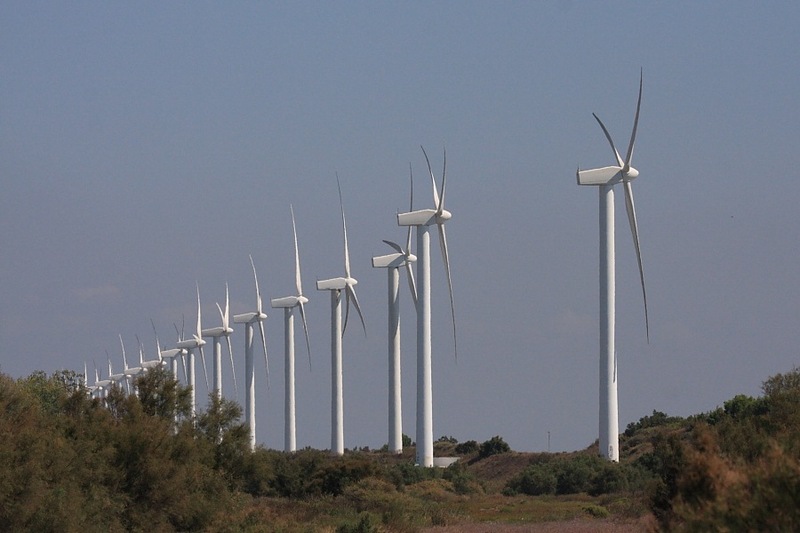 The French are pretty good at harnessing the power of the wind. Although the majority of their electricity is generated by nuclear power, they do seem keen on alternative technologies and you don’t travel far before running across a parc éolien [wind farm]. Perhaps unfashionably, I rather like them, though I can’t see them as a realistic alternative. Here’s an example that we ran across on this trip in Provence where there is a very famous source of pretty reliable wind power, the mistral. Following lunch yesterday in Dieppe, we meandered along the so-called Côte d’Alabatre [Alabaster Coast]. The term alabaster is a bit optimistic since the cliffs looked decided dirty yellow so it must be a French P.R. job attempting to rival the White Cliffs of Dover. 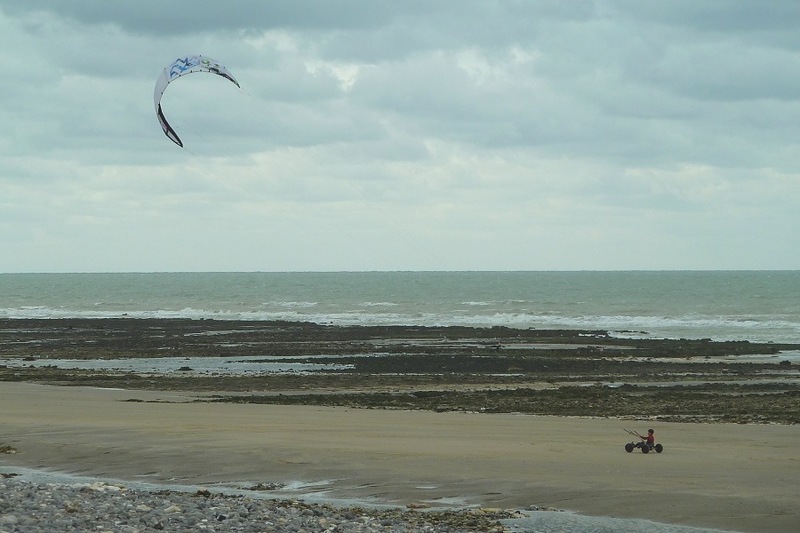 There was a stiff breeze blowing off la manche [the English Channel] which many locals were out demonstrating various ways to make leisure use of. First up, a double-header shot. Out on the water itself were several kite-surfers. Now, this makes sense to me, though it looks much too difficult for one as uncoordinated as I who dislikes getting cold and wet. I’ve watched regular surfing in Cornwall and that seems to consist of a lot of paddling ones surfboard out from the beach – very tiring – followed by sitting on ones surfboard for ages – very boring – waiting for a decent wave (usually the seventh?) for a very short ride back to the beach. Repeat. 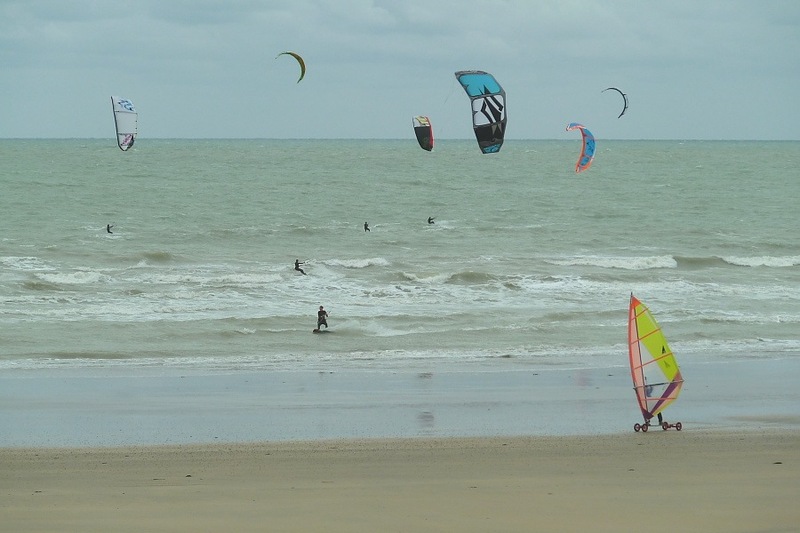 The kite-surfers are on the go all the time. In the foreground of the same picture is something I hadn’t noticed before – what I can best describe as a sail-powered skateboard. This, at least, seems to avoid the “getting wet” bit though perhaps not the “getting cold”. Too much effort standing up? Want a seat? Try this variation. 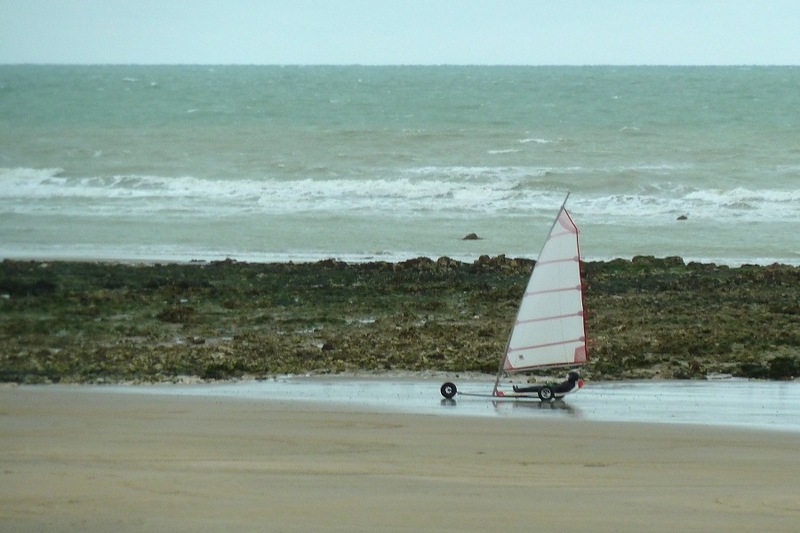 I’ve no idea what this contraption might be called or how one concentrates on steering the cart device as well as controlling the kite, but it seems to take kite-surfing out of the water and puts in on the beach with the added comfort of a seat. Finally, if you really want something comfortable, maybe land-yachting would be your thing? Here’s an example fitted with what appears to be a Recaro rally seat for a real treat. Actually, if this driver got much lower down, a single bed might be more appropriate.